Sometime around 5.30 am when the sun rises in winter in Guwahati Assam, that precious time in the morning when all kinds of bird songs fill the air and a vibrant golden glow starts to appear in the north-eastern sky, one other very consistent sound accompanies the birds. It’s a steady swish-swish of a broom. It’s one of the early memories from my childhood Diwali vacations spent at my grandparent’s place in Assam – a picturesque Railway Colony, a short walking distance away from the banks of Brahmaputra1, at the start of a wild and untamed hilly area. The swishing sound was my grandmother clearing in the front yard, leaves shed by the gigantic jackfruit trees. Her daily schedule at the time (given her age and the winter chill) would put any multitasking executive/supermom to shame. She cooked the most fabulous meals for all of us, took care of her chair bound husband, read the newspaper cover to cover and to her husband whose eyesight wasn’t what it used to be and found time to watch TV. Every time we visited, she had a new creative project on – she used to hand embroider saris and shawls. Amazing designs conjured up by her, hand drawn on Assam silk and then fabulous multi coloured silk threads deftly woven on the fabric, creating magic. My mom and aunt still wear their prized handmade custom designed Assam silks to weddings and functions and it’s almost always the most beautiful and distinctive sari in the room. My conversations with my grandmother happened during her art and craft time in the afternoons – she would sew and ask me about my plans for the future, my hobbies and interests. I do not ever remember feeling like a child during those conversations – she addressed me as if I were a young woman with thoughts and ideas of my own. Strange considering I was not yet a teenager then (not so strange considering her background, as I found out). She told me to dream big, progress in life, get a really good education (a very common Bengali trait) and balance it with marriage and children. She told me about her teenage years, when her parents would invite prospective grooms and family for tea and she had to speak a few lines in English and repeat letters in English, to demonstrate her education2. All of that ended when my tall and handsome grandfather came to see her and her most exciting life adventure enfolded. My grandfather was almost not allowed to marry her. Apparently, word reached his parents that although the girl was beautiful, educated and talented, she was slightly dark skinned and his elders couldn’t bear the thought of their extremely fair skinned, very handsome boy marrying anyone dark skinned. He retaliated by saying that he wouldn’t marry anyone else but this girl, that too without meeting her. Quite a revolt in a traditional Bengali set-up, where his highly respected father (a Judge) at that time ruled over the household. All of this transpired in what is now Bangladesh, at a time when the British ruled over India, somewhere around 1935-38 in all likelihood. His marriage wasn’t his sole act of revolt. As times changed, he joined the Swadeshi movement3 and was an active member of the movement. It could not have gone down well at home and it must have strained relations all around; but at the same time there must have been a growing sense of pride among others in the family. My grandparents were extremely attached to one another – not just old age and the necessity to bond as a result of the issues that came up with advancing age, but genuine affection. So, imagine my astonishment when sometimes they had very loud arguments – and no one else in the house blinked. My uncle would say leave them alone – they’ll come around eventually and they did. By dinner time they were back to their dignified selves. It seems, they were on opposing political sides – something to do with the politics in Calcutta – a city where they never lived4. Not until I pieced together their back story, did I understand why they were so politically aware and involved in something happening somewhere far away from their home. Their idyllic existence in Bhola Bangladesh,5, where they lived with their large extended family in a sprawling house respected by the community and the officials in charge, changed irrevocably and literally overnight. One day, there appeared a police posse at their door demanding to know if a certain Swadeshi by the name of Nani Gopal Chakraborty was at home at that moment and if so, they had an arrest warrant for him. The story goes that the family played for time before they let the police in and in that short span of time, Nani Gopal Chakraborty, my very dignified law abiding (to my knowledge) grandfather jumped on to the roof and sort of hopped on and off the roofs and boundary walls of neighbouring houses and escaped, never to return to that town. He ran away with his Swadeshi friends, leaving behind his young bride and didn’t stop running till he reached probably Calcutta and from there went to Guwahati Assam. After a long time when things cooled off, he sent for Bela Chakraborty his young bride, to join him in his new life without the security of a job, the protection of the influential family and absolutely no other relatives or acquaintances. I never actually asked them how they survived, what did they do, so I can only imagine how difficult it must have been. The burning passion to do something for the country, the Swadeshi spirit, finally found a new way of expressing itself. 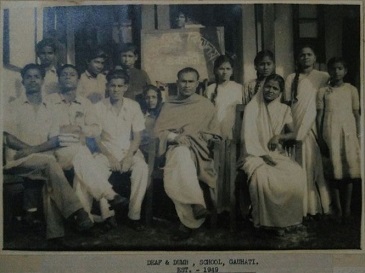 Within a few years, they started a venture, a school for the Deaf and Dumb called BDS Deaf and Dumb School in the heart of Guwahati city in 1949. 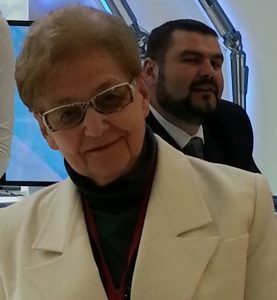 He was the Founder and Principal and she was a teacher and one who managed all administrative work. They trained themselves and then other teachers over time. There are stories my mother told us of grandfather playing football and all the other active games during school sports days, a very involved and hands-on Principal even by today’s standards. My grandmother kept an eye on the teacher training and financial side of things and her growing family (three children and a home). Those years must have shaped her lifelong habit of being in charge, being a leader and innovator. I was not just her grandchild when she told me about her life, but a young life that needed to be inspired. The high point of one of my vacations was finding a treasure trove of old photographs, stored carefully in old trunks. Imagine my shock and surprise one afternoon, when I found myself looking at my grandparents and all the teachers sitting next to Pandit Jawaharlal Nehru and his young daughter Indira6. Apparently, the school had garnered so much interest that it was on the Assam itinerary of the Prime Minister of India! Time passed on. They retired from active school duty, and eventually from this life as well, but the school still lives on, in a new location with almost the same name. It’s now called Govt. B.D.S Deaf and Dumb School. 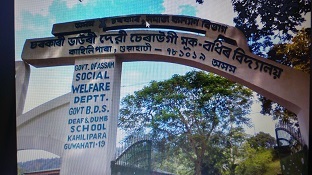 For a long time, it was the only school for the Deaf and Dumb in Assam. Here’s a picture of the school gate as it is now. I wonder if anyone there knows how this school began its life. Do they know that a certain Marwari7 investor donated money to the school and in return asked that the school be named after his mother Bhawree Devi Saraogi, hence the BDS in the name of the school? Do they know about the two passionate founders of the school who are not named anywhere? 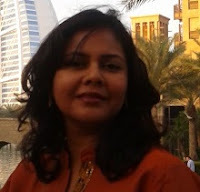 Sushmita Basu Fernandes lives in Dubai. Mitha : A poignant and thoughtful piece, that takes every reader back in time – not just to Bela and Guwahati, but in my case Thankam and Kuttiatoor in Kerala and to others, their own grandmothers and their villages, small towns and cities across India and indeed, the world. Our grandparents were all, activist or closet,'swadeshi' in their own way. They lived during difficult times, but didn't turn into whingers and whiners. They dealt with the many challenges they faced, both mundane and existential and they did it with quiet fortitude. They were not embittered by their life experiences, but rather, empowered by them. They embodied the spirit of service, not to oneself but to community and society and by extension – nation. Your note is timely, in that as parents ourselves, we should seek to infuse in our children the notion that individual success counts for nothing if one is surrounded by failure. Sushmita what a beautiful legacy you have! And you write so beautifully… I almost feel as if I am acquainted with your grandmother. A wonderful and touching story Sushmita. Keep writing more.